Chelsea have agreed a deal to sign defender Baba Rahman from Bundesliga side FC Augsburg. 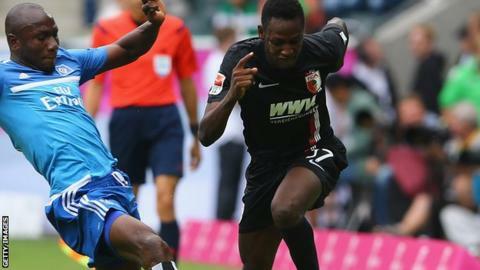 The Premier League champions confirmed the move for the Ghana international, 21, on their club website with Augsburg saying the fee will remain undisclosed. Chelsea had been linked with the left-back after allowing Brazil international Filipe Luis to re-join Atletico Madrid earlier this summer. He said: "I am very happy to sign for one of the biggest clubs in the world." Chelsea manager Jose Mourinho, whose side lost 3-0 at Manchester City on Sunday, said: "It is important because he is a left-back, so he can compete with [Cesar] Azpilicueta. "At the same time, Azpilicueta can compete with [Branislav] Ivanovic for the right-back position, so he replaces Filipe Luis in the balance of the squad." Rahman spent 12 months with Augsburg after signing from SpVgg Greuther Fürth in August 2014, making 31 appearances for the Bavarian club last season as they qualified for the Europa League. He was also a member of Ghana's Africa Cup of Nations squad which lost in the final to Ivory Coast in February.